This year’s off season headlines have been buzz worthy to say the least, and the major news continues this week with the announcement of Manu Ginobili‘s retirement. At 41 years of age, Ginobili has decided to hang up his jersey after an incredible 16 years in the NBA. Ginobili was drafted into the league in 1999 as the 57th overall pick in the second round by the San Antonio Spurs. The 6’6″ guard from Argentina played for San Antonio for the duration of his lengthy career and was a staple of the Spurs roster throughout some of their most successful seasons. Ginobili played with basketball greats Tim Duncan and Tony Parker. He embraced coach Gregg Popovich’s fundamental style of basketball that brought the Texas franchise so much success. While playing for the Spurs, Ginobili contributed to a total of four Western Conference Finals appearances, and four NBA Championship titles with a playoff appearance each year, and not one losing season on the books. Ginobili averaged 13.3 points, 3.8 assists, and 3.5 rebounds per game while shooting 36.9% from distance, and 82% from the free throw line over the course of his career. Ginobili was named to the NBA All-Rookie second team in 2003, the All-NBA Third team in 2008 & 2011, Sixth Man of the Year in 2008, and was selected as an NBA All-Star two separate times in 2005 & 2011. He tallied a total of 1,057 games played in the NBA bringing in 14,043 points along the way. With such a decorated career, Ginobili’s impact on the league can’t only be limited to his success within the Spurs organization. His unique style of play was a little before its time given that he played small ball before it was in. Ginobili had an incredible ability to sink impossible shots from deep while luring his defender into a foul. Drawing fouls and pushing the envelope for the extra point whenever he could was both exhilarating for his fans and enraging for his opponents. Ginobili developed an incredible basketball IQ throughout the course of his career that set him apart in the league. This allowed him to play with a steady and patient poise that has become the signature of a San Antonio Spur–almost like the proverbial tortoise in his race against the hare. And, what’s remarkable about this hall of fame career is that he did it all while coming (mostly) off the bench. In this day and age of the “me-monster” and the insistence of self-promotion, it’s nearly impossible to fathom that someone could accept a bench role with such pride and enthusiasm. But, that’s exactly what made Ginobili so successful. He not only accepted his role, he embraced it, and as a result, he will go down in history as one of the greatest basketball players to ever play in in the league. Ginobili was a true professional and a humble contributor to his team’s mission. 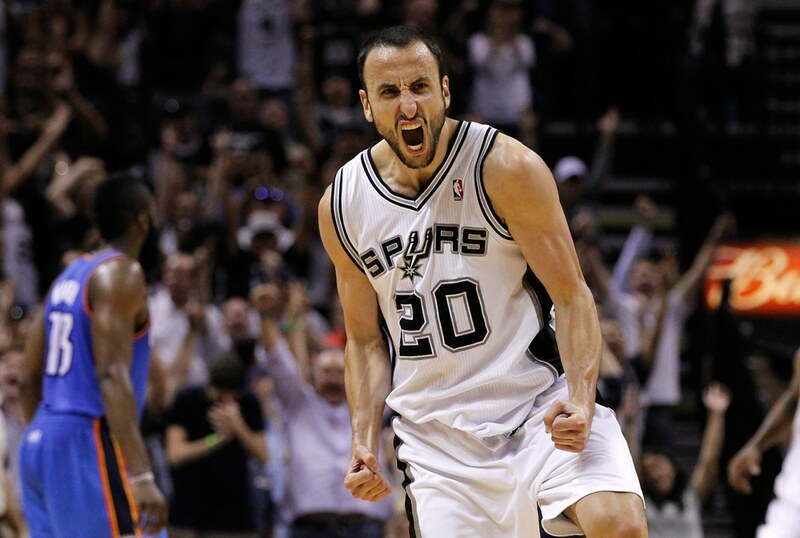 Ginobili’s model of unselfish basketball will be truly missed in the league. His retirement marks one more step toward the closing of an important era of basketball in the NBA. With the retirement of Duncan just a couple of short seasons ago, San Antonio’s empire will face a tremendous rebuilding challenge that may never be able to replace what was there before. The Spurs’ model of fundamental basketball and role-playing is a proven success, and each new player is subject to San Antonio’s regimented training and indoctrination. The difference now is that the staples of mentorship on the team have moved on making room for a new group of leaders to come into their own. Time will tell if they’re able to recreate the magic that once defined the organization. Best of luck to Ginobili in retirement. It won’t be long before we see his jersey hanging in the rafters of the AT&T Center.